Fue Yang '08 found the reassurance he needed, and now he's helping others to find it within themselves. A degree in psychology was his stepping stone to his current work, helping his fellow members of the Hmong community through therapy. Yang, a first-generation college student, grew up on a farm outside St. Paul. He chose St. Scholastica because of its location. Like many an 18-year-old, he wanted something close to home, yet not too close. He started out as a pre-med student but wasn't certain of his path. Sister Edith Bogue, associate professor of sociology, encouraged him to take a few different classes, like psychology and philosophy, to find his true vocation. "She's been a big part of my life," Yang said. "She really believed in me." She was impressed with his resolve and desire to give back. 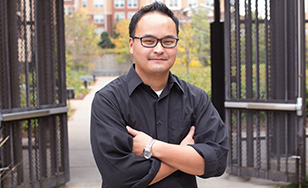 "Fue was quite determined to succeed in college, but he always saw that success not only for himself but also a commitment to choose a profession that would be of service to the Hmong community," Bogue said. He exemplified the Benedictine value of "community," she said, by cooking for members of the Psychology Association of St. Scholastica/Psi Chi student group. "While Fue was at CSS, the student group never ate so well - he would cook entire meals for PASS/PsiChi parties, which were, of course, quite well-attended," Bogue said. "Fue really understands that you have to give community to others, not wait for others to give it to you." "Fue's sense of personal ethics, fueled by humanitarian interests, was well above the typical undergraduate student," said associate psychology professor Gerald Henkel-Johnson, who was instrumental in helping Yang decide to major in psychology. "I just really fell in love with the program," Yang said. "I felt like that was something I was really passionate about, helping people. I felt like that was my calling." With help and preparation from the McNair Scholars program, Yang went on to attend graduate school at Indiana State University. "It was another great opportunity where McNair really helped push me," he said. "I really endorse the TRIO programs and McNair. It's been a blessing to be involved." He's now a full-time psychotherapist at the Amherst Wilder Foundation. Henkel-Johnson is proud of everything Yang has achieved in the St. Paul community. "Fue's mental health work with the Amherst Wilder Foundation clearly fits with his ethic of the value of community, which is of course consistent with the Benedictine value of community," Henkel-Johnson said. Seeking to make a difference in his own community, Yang runs a therapy group for young Hmong men and another for Hmong males dealing with depression. He keeps busy with side jobs as well - including conducting therapy with federal prison inmates transitioning back into the community. He works hard to relate to people on their own level, encouraging them to think about therapy as routine maintenance, like an oil change. "Sometimes we just need someone there to kind of help us and guide us," he said. "I'm not judgemental of them." He's grateful for the opportunity to make a difference. "I just have a passion for helping people. If I get to help one person, that's good enough for me."